Breakfast has always been my favorite meal, but always one of the more difficult meals for me, having so many food allergies. 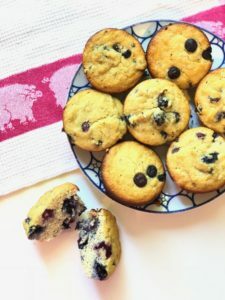 So I love to make creations that are allergy friendly, and SO delicious- just like these blueberry muffins. These blueberry muffins are paleo-friendly, and the only common allergen in them is egg. If you’re egg-free you can use aquafaba (from chickpeas), instead! These muffins are easy to make, ready in under a half an hour, and I was careful not to use really obscure ingredients, in hopes that you’ll be able to whip them up in no time. Instead of using lots of sweetener I also used banana- but the good news is that in the recipe you can’t really taste the banana. Try these muffins for breakfast or for any meal! Next PostAre you spending too much time on social media?